If you followed our coverage of this season’s grand tours, you might have tried your hand at winning one of several super cool (yes, I say things like “super cool”) t-shirts from Laekhouse. Designed and screened (by hand) in a Brooklyn apartment, Laekhouse shirts merge iconic cycling images with hipster-endorsed American Apparel t-shirts. Last year I recommended you pick-up Squad from the Icon Series. This year, my two favorites are The Climber and 1986. 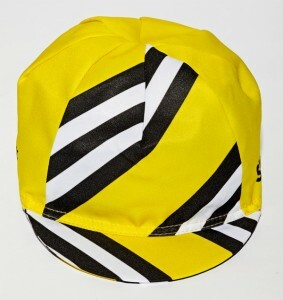 I’ve also got my eye on one of the new line of Super Tour hats–especially Yellow. So go have a visit–the site’s front page is worth a trip all by itself–and if you order, tell them we sent you. Pros: Terrific designs. American Apparel shirts are simply the best for fit and feel. Peeves: These are hand-screened on an as-ordered basis–so order soon for the Holidays. AA stuff tends to shrink a bit more than I like. This entry was posted in Featured, Musette and tagged caps, holiday gift guide, Laekhouse, t-shirts. Bookmark the permalink.